Chennai Super Kings 187 (Michael Hussey 47, Suresh Raina 47, Dwayne Bravo 38, Rowan Richards 3-29) beat Titans 5-185 (AB de Villiers 77, Henry Davids 52, Dwayne Bravo 2-34) by four wickets. Titans scored 185 runs with half of their side back in the dressing room in the measured 20 overs and Chennai Super Kings grabbed the target by amassing 187 after losing six wickets in 18.5 overs. Suresh Raina (Chennai Super Kings) was declared ‘Player of the match’ for his match winning knock of 47 runs. The third match of the Champions League Twenty20 was held on Sunday, September 22, 2013, at JSCA International Stadium Complex, Ranchi. Earlier, MS Dhoni, the captain of Chennai Super Kings, won the toss and invited Titans to bat first. Henry Davids, the skipper of the rival team opened the innings with Jacques Rudolph and scored 22 runs in five overs. Davids hit the first six of the match in the next one and Rudolph added a couple of fours in the seventh over but was unluckily run out for 21. AB de Villiers got in next while Davids kept on cruising at the other end with regular boundaries. AB de Villiers hit 2 sixes and 1 four in the coming overs and posted the hundred of the innings after 12 overs. He was dropped at 30 as Davids reached his 13th Twenty20 fifty but was stumped by Dhoni off Ravichandran Ashwin for 52 from 43 balls with 2 high sixes and 4 fours. Farhaan Behardien appeared on the scene next, hit 1 six and 2 fours instantly and AB de Villiers smashed his 17th Twenty20 half century with another six on the 27th ball he faced. Behardien was gone for 21 whereas the latter punished Ravindra Jadeja for 17 runs with 2 sixes and 1 four. AB de Villiers was finally caught by Dwayne Bravo off Jadeja for 77 from 36 mere deliveries with 7 towering sixes and 3 fours. Titans managed 185 for the loss of five wickets at the close of the 20th over. Dwayne Bravo was the top wicket taker with two whereas Ravichandran Ashwin and Ravindra Jadeja shared one wicket each. 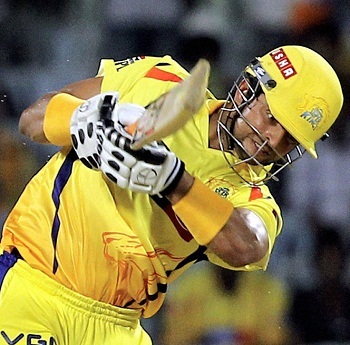 Chennai Super Kings went down by one wicket at 6 when Suresh Raina got together with Michael Hussey. The latter hit 3 fours until the third over and the duo accumulated 24 runs in the next one with 1 six and 3 fours. The run rate was boosted up by the two batsmen and the score jumped to 95 after 7.5 overs as Raina was caught by Morne Morkel off David Wiese for 47 from just 28 balls with 2 sixes and 5 fours. Michael Hussey added 1 six and 2 fours in the following overs and lost his wicket for 47 off 26 with 1 six and 7 fours as the score touched 114 in 9.6 overs. Dwayen Bravo and Subramaniam Badrinath kept the chase alive by sending the ball out of the fence on several occasions. Chennai Super Kings required 31 runs to win the game from the last 30 balls and Bravo grasped 1 six and 2 fours before he was stumped by Mangaliso Mosehle off Rowan Richards for 38 from 26 balls with 2 lofty sixes and 4 fours. They lost another two wickets in quick succession as Albie Morkel hit the winning four on the fifth delivery of the 19th over. Badrinath secured his end for 20 as his team powered 187 with four wickets remaining. Rowan Richards was the highest wicket taker with three whereas Roelof van der Merwe, Morne Morkel and David Wiese got one wicket each. Chennai Super Kings clinched the game vs. Titans with a margin of four wickets which enabled them with four points.